Stylistically, the overall sound of the Mamas and Papas is a folk pop that remains true to their folk origins, with a nod to standards and show tunes, and that showcases their playful approach to singing and their extremely imaginative harmonies. That does not mean that they do not have any variation in their songs, however. Indeed, their body of work includes everything from the sultry ballads that made Mama Cass so famous to the more psychedelic tunes of their final albums. They also covered quite a number of famous songs but changed them drastically to reflect their own style and approach to singing---thereby making them all their own. Socially, the group epitomized everything that we have come to associate with the late 1960s. Indeed, the Mamas and Papas lived out the entire California youth philosophy of the time---wild clothes, free love, recreational drugs, wanderlust, and an idealistic belief in their ability to overcome. Some of their songs speak to the social problems of the decade but most focus on the conflicting freedoms and insecurities of youth and music and relationships in their day. 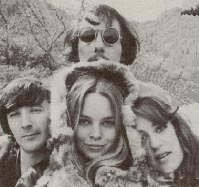 On this site, I’ve tried to compile a discography of their work as well as to tell a little bit about the members of the group before and after the surprisingly short Mamas and Papas phenomenon (they were only together from 1965-1968!). Since I started this site, I've come to discover that the Mamas and the Papas are not only one of my favorites, but are also the favorite of many people across the world. This site has grown a good deal since I started it, and I thank everyone for showing their interest and enthusiasm. Liner notes and images from some of their albums. The albums released by the Mamas and the Papas. Do You Wanna Dance? A lyrical library from their first hits to their reunion album. Thanks to all who have written and/or linked to this page! Can't find what you're looking for on this site?